At Copley Junior we encourage children to develop a positive, caring attitude towards other people. As part of this we support many charities each year. Our theme for our Harvest Festival 2018 was 'My pizza as big as the sun.' During the service children from each class shared fascinating facts about the different foods that are added to make a pizza and the food miles involved, which was quite remarkable. Once again, we were very impressed with the children's wonderful singing. Thank you so much to everyone for your fantastic generosity. Packet, tinned and fresh produce and toiletries were displayed on every surface and ledge in St Mary's. Doncaster Foodbank is very grateful for our support and our donations will help many local families in need. 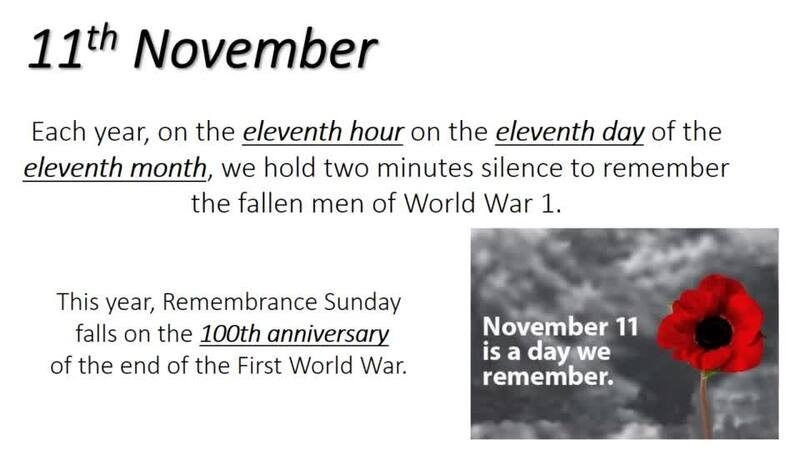 We observed the two minute silence as a school community in remembrance of all those who have served our country. We sold poppies and poppy reflectors for school bags, which were very popular and raised £188.45 for the British Legion. Our School Council planned activities to have fun and raise money for Children in Need, including a non-uniform day with a colourful/spotty theme and the opportunity to watch Disney animation movies at break times, with a small admission fee to raise funds for this worthwhile charity. Every year we fill Christingle boxes to raise funds for The Children’s Society and present these at our Carols and Readings Service at St Mary’s Church. This year we raised an amazing £265.54. Thank you so much for your generosity. We enjoyed wearing our Christmas jumpers for our Christmas Lunch and raised £101 for Save the Children. This is enough to pay for 75 books to replenish a school library in Rwanda. For the sponsored element of Sporty Week, our Sports Council decided to challenge children to complete as many laps of the playground as possible in 5 minutes. The children worked in partners, with one child competing and one child recording laps and encouraging their partner before swapping over. The children all gave 100% effort and also cheered their partner on to achieve their best. Well done everyone! We decided to raise funds for the Eve Merton Trust, a local Doncaster charity that supports children and adults living with cancer to achieve their dreams, and also to raise funds to buy more playtime equipment to keep children active at break times. We raised an amazing £884 - thank you so much for your generosity! We have been able to buys lots of new playtime equipment and we presented a cheque for £442 to the Eve Merton Trust. Every two years, the NSPCC visit school to deliver a 'Speak Up, Stay Safe' whole school assembly and they lead workshop sessions for children in Years 5 and 6. As well as promoting key messages about staying safe to help safeguard our pupils, we take the opportunity to raise funds for the NSPCC and were able to make a donation of £91. We celebrated Roald Dahl Day by dressing as our favourite Roald Dahl characters. We raised £130, with 50% going to Roald Dahl's Marvellous Children's Charity and 50% was spent on new Roald Dahl titles. Every two years, the NSPCC visit school to deliver a 'Speak Up, Stay Safe' whole school assembly and they lead workshop sessions for children in Years 5 and 6. As well as promoting key messages about staying safe to help safeguard our pupils, we take the opportunity to raise funds for the NSPCC. In June 2016 we raised an amazing £931.40 for the charity. Following our balloon release in memory of Mr Siddall, we raised an amazing £516 for the Eve Merton Trust. The Eve Merton Trust is a very worthwhile charity that grants wishes to people with cancer in the local area. We are very proud that some of our thoughtful pupils decide to organise their own fund raising events for charities that are special to them. Well done to our pupils pictured below who organised two activities to raise funds for the Blood Cancer charity Bloodwise – Guess the Sweets in the Jar (20p per guess) and Guess the Name of the Dog (50p per guess and the prize is pictured below!). Thank you to everyone for your generosity. Altogether the girls raised an amazing £123.20 for Bloodwise. We are very proud of the children for organising such a successful fundraising event. Emilia K, her sister and some friends decided they would like to organise a bake sale to raise funds for guide dogs. The bake sale was a tremendous success and the children raised £277. We are incredibly proud of Charlotte M, who decided to embark upon the enormous challenge of swimming the distance of the Channel over 12 weeks to raise money for 'Aspire'. Charlotte said, "I swim competitively for Dearne Valley Swimming Club and I am the first person at Dearne Valley Leisure Centre who swam 3000m, so I'm ready for a challenge that will also give me the opportunity to help others. Every eight hours someone is paralysed by a Spinal Cord Injury and Aspire provides the essential equipment, advice, housing and grants that spinal cord injured people need to live their lives independently. This is a big challenge, but the more I raise, the more of a difference I'll make." Charlotte achieved her goal of swimming the distance of the Channel within 12 weeks and raised £160. Well done Charlotte! We are very proud that one of our Year 6 pupils decided to organise a collection of gifts so that the Salvation Army could distribute these to families in need at Christmas. A total of 206 presents were donated! Jemma decided to raise funds for the British Heart Foundation in memory of her father. Jemma created a PowerPoint, led an assembly for all the pupils in school to raise awareness of the charity's work and arranged for the British Heart Foundation's mascot to make a special guest appearance. She wrote a letter to all families inviting children to 'wear something red' and to bring a donation for the charity on the day if they would like to. Children thoroughly enjoyed presenting their clothes on the cat walk to disco music. Jemma raised an amazing £720! As a result, Jemma was invited to the British Heart Foundation's Awards Ceremony and was presented with the 'Young Heart Hero' Award. Jemma has demonstrated great courage, thoughtfulness and organisational ability and we are very proud of her. We are very proud of Billy J, who decided he would like to raise money for Cancer Research UK. Billy organised a number of events to raise funds including a teddy tombola at school and garage and bake sales at home. He also took part in the 6km Sprotbrough fun run. Billy shared in our Friday assembly that altogether he raised the impressive sum of £295! It is lovely to share that we have such thoughtful and proactive pupils in school. Well done Billy! We are very proud of Joshua L, who decided he would like to support the work of the Yorkshire Air Ambulance. Joshua bought a jar full of sweets to school and he invited children (and adults!) to bring in a £1 and have a go at guessing how many sweets were in the jar. Joshua and his mum sent all the proceeds to the Yorkshire Air Ambulance and well done to Mrs Henfield, who made the closest guess and then kindly shared her prize with all the children who had taken part. Joshua raised £58. Diabetes Awareness and Fund Raising – Alistair leads the day! Alistair decided he would organise a Diabetes Day in school, to raise awareness and raise funds for research into the condition. With his friends, he prepared a PowerPoint presentation about diabetes and a dress up day in the charity colours. Altogether he raised an amazing £337.44! Well done also to Fay and her management team of pupils who organised a fun run at Cusworth Hall Park in support of the Yorkshire Air Ambulance, planning every detail on their own. Fay and her team organised medals for all participants, prizes for the best dressed runner (well done to Kaden, who must have got very hot running around Cusworth Hall Park dressed as Harry Potter!) and most helpful donation. A fund raiser from the Yorkshire Air Ambulance joined our Monday assembly to tell the children about the life saving work of the charity and Fay presented a cheque for £639! Well done to all our pupils who have both led and supported the fund raising activities. We are very proud of you!